The Rockler Router Bit and Saw Blade Cleaning Kit gives you everything you need to keep blades and bits clean and cutting as they should. I learned long ago that when a blade or bit starts cutting like it’s dull the first thing I do is clean it. More often than not the supposedly dull cutter performs like new. 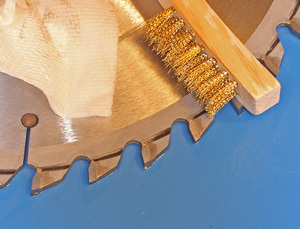 The problem has always been how to clean a blade or bit without compromising the integrity of the cutter itself or the bond between carbide tips and the body of the blade or cutter. People have used all sorts of concoctions over the years, including the highly caustic oven cleaners even though many manufacturers warn against it. Today, with purpose-designed, safe cleaning materials like the Rockler Router Bit and Saw Blade Cleaning Kit available using anything else just does not make good sense. 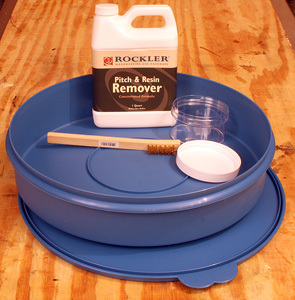 The Rockler Router Bit and Saw Blade Cleaning Kit includes a 14'' blade bath with lid, 1 quart of Pitch and Resin Remover (makes 1 gallon), a 6 oz. plastic jar with lid (for cleaning router bits) and a brass-bristled scrub brush. The blade bath container has a 14” inside diameter which allows cleaning up to 12”-diameter blades and still has room around the outside to retrieve the blades. The bottom of the bath has a raised ring that keeps the blade off of the bottom so all of the surfaces soak equally and the blade can’t “suction” to the bottom and give you fits trying to get it out. I know this sounds like a little thing but I can promise you the old plastic container I used to clean blades in took a violent ride into the recycling bin when I discovered this feature of the Rockler Router Bit and Saw Blade Cleaning Kit. The Pitch and Resin Remover is non-caustic which makes it a bunch safer to use than many materials like oven cleaners. It also appears to be safe for at least most of the coatings we find on our modern blades and bits. I would suggest putting a drop of the Pitch and Resin Remover on the coating to test it before submerging the blade or bit in it. I have yet to hear of a problem but being sure is so easy. The dirtiest blade I had (left) cleaned up with just under 5 minutes in the solution and a few swipes of the brass brush to know off the heavy spots. 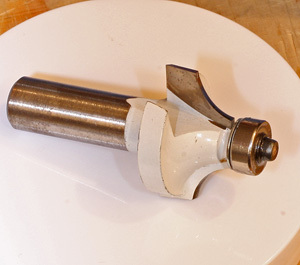 This is an old Jesada router bit (right) that I thought was hopeless so soaked it in the Rockler solution for 5 minutes and with a little brass brushing, it looks almost new! The Pitch and Resin Remover is at least partially citrus based judged by the smell. Mix up a batch and the shop smells like cut oranges, a pleasant odor that won’t get you in trouble should it waft into the house. This material is concentrated so mixing one part Pitch and Resin Remover to three parts water gives you a good cleaning solution that will handle most jobs. The container says that you can used the Pitch and Resin Remover full strength (smaller amounts applied directly to the problem build up) for stubborn contaminations which is a nice way of telling you how to clean up blades and bits that you have neglected for too long. Both the large round blade-soaking container and the plastic bit jar come with sealing tops so you can preserve and re use the cleaning material beyond one use. It won’t last forever but if you are cleaning your blades and bit regularly getting 3 or 4 uses from each batch of cleaner is not unreasonable. I expect that I deal with virtually the same bit and blade contaminants that you do. Throughout my evaluation the Rockler Router Bit and Saw Blade Cleaning Kit cleaned my cutters easily and thoroughly. The brass brush does come in handy for the stubborn spots but the cleaner itself handled nearly everything on my blades and bits. I learned long ago that a clean blade or bit performs better. I found this out when out of desperation I followed the advice of a friend and tried cleaning a table saw blade that I thought was hopelessly dull. He was right and the newly cleaned blade cut like it was supposed to. The Rockler Router Bit and Saw Blade Cleaning Kit just might keep your blades and bits cutting better and longer for the very reasonable price of $27.99 (2-18-2013).